Vincent Rougier, artist and editor, is perched behind his stall. Still wearing red scarf and Indiana Jones fedora in the slightly chilly hall, he is conversing with friends and not paying much attention to the passersby. I interrupt to ask how his day is going. “We haven’t been overrun with visitors today. But you come here to meet people, and to catch up,” he says. Tiny pamphlets in various colours cover the trestle table in front of him. Each one is a dozen or so still-uncut pages, individually sewn, the coloured threads dangling, inviting the reader to unravel its insides. The original illustration on each cover – a sketch of dancing figures, a man walking on his hands, the letter A next to a hot air balloon over a yellow and blue sea – extends a further invitation to the eye; the expensive paper gratifies the fingers. All bear a stamp reading La Revue Ficelle (‘string’) and the legend “the revue only publishes what pleases it and that’s not likely to change.” Across the aisle, an identical table is piled with weighty copies of Europe, the venerable fellow-travelling publication founded by Romain Rolland, the tiny print of the latest copy dedicated to studies on Diderot, Sartre and Chris Marker. 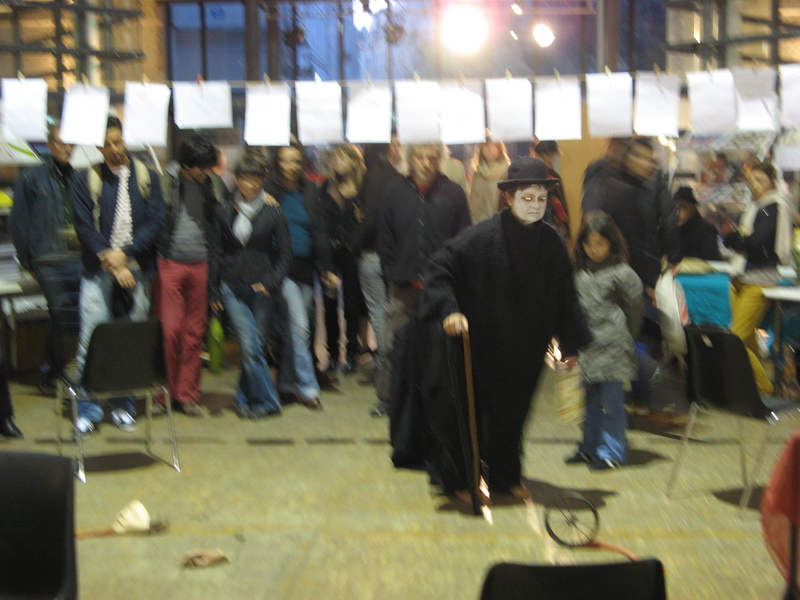 Welcome to the Salon de la Revue, held annually under the white stone and wrought iron arches of the Espace Blancs Manteaux in the heart of the Marais, Paris, where artistic creations like Ficelle – sometimes Rougier attaches the tails of thread to a parasol, the rain of books turning his stand into something of an artwork itself – rub shoulders with important humanities and social sciences journals of French academia, such as those of the École des Hautes Études en Sciences Sociales, with all kinds of small independent publishers in between. Everyone wants to promote and sell their product, but for many the event is a firm calendar fixture because of the opportunity to cross paths – to meet potential collaborators, devise plans for articles, conferences, poetry readings and exhibitions, to take the pulse of one’s field of study or creation, to have unexpected encounters and catch up with old friends. The participants wander among the hundred or so stands, sometimes briefly abandoning their own, to seek each other out for a chat, fuelled by homemade quiche and gâteau fromage blanc from the improvised coffee stall. Despite the shiny posters and leaflets and large Radio France Culture banner, there’s a DIY feel about the whole affair. It is, in a sense, the antidote to the bookfairs of Paris, London and especially Frankfurt, where the corporate titans of publishing clash in order to wrestle out the latest contracts. Jérôme Carassou, from Éditions Non Lieu, tells me this is in part due to the nature of the revue itself. “The revue is, and always has been, a bourgeois production, financed by the editors themselves. It really thrived because of the publishing culture in France in the 19th and early 20th centuries. The situation was more repressive than in Britain, with its more liberal tradition – here, intellectuals created revues in order to circulate writing they couldn’t get publishers or newspapers to take on.” The dictionary Larousse defines the revue simply as a “periodical publication which specialises in a certain field,” which in practice covers everything from thick academic journals to what are effectively glossy art magazines. While Anglophone equivalents for the various kinds of revue certainly exist – not least the various “reviews of books” around the world – we lack an umbrella term with the same immediate connotations, standing at a crossroads between academic writing, poetic creation and creative essay, the paper manifestation of the esprit of the homme or femme de lettres. Today’s revues perhaps have roots in their deeper bourgeois history: the famous political pamphlets of revolutionary France, like Le Père Duchesne. The golden age, however, was the inter-war years, with the widespread readership of major publications like Gallimard’s Nouvelle Revue Française and the frenetic activity of the avant-gardes. Considering the sharp tensions of the time, with fierce debates raging across the pages (and sometimes into the streets) and groups like the Surrealists literally using the revue as a political manifesto, the extent to which the republic of letters maintained its foundations was sometimes surprising. The paradox was exemplified under the occupation by the relationship between Jean Paulhan, founder of the clandestine revue Résistance, and the collaborator Pierre Drieu la Rochelle, who took Paulhan’s place at the head of an expurgated NRF but used his influence to save his former literary associate from arrest and execution. While the influence of the revue has dwindled, the vibrant eclecticism remains. This is evident in the programme of talks and debates on offer (like the Salon, free and open to the public), whose subjects include the current influence of Machiavelli (organised by the Catholic revue Testimonianze); Say it loud! Ten years of university publications on popular music: the case of the revue Volume! ; the launch of a new poetry revue named after a Winnebago lake in Wisconsin; the state of the Russian Orthodox Church and the new ‘Holy Russia’; Writing(s) and Madness(es) with the Nouveaux Cahiers de la Folie; the life and work of the Tsigane singer Papusza and the current situation of Roma in Europe; The refusal of theory: the academic consequences and the political meaning of an epistemological naivety in the social sciences; homosexual identities on both sides of the Mediterranean; the threat to democracy in Europe and – of course – how to defend contemporary poetry in France. I attend a ‘round table’ organised by the Franco-German open access social sciences revue Trivium titled Europe thinks in multiple languages (Umberto Eco: “The language of Europe is translation”). Trivium editor Hinnerk Bruhns scolds the salon for not including more non-French or multi-lingual revues – somewhat unfairly, I feel, as several of the publications I flick through in the hall contain articles or poems in two (or even several) languages. Leyla Dakhli of the Centre National de la Recherche Scientifique highlights the fact that Europe does not think only in European languages, as well as European translation’s importance as an intermediate for the transmission of thought outside of its borders (for example, the reception of Hegel in Lebanon through French translations), as the Salon attests to in the form of reviews like Africultures and a special event dedicated to the Algerian writer Taos Amrouche. However, the conversation really heats up in the exchanges between a director of the E.U. Directorate-General for Translation and the esteemed sociologist Jean-Claude Barbier, who claims that despite the pioneering official policy in Brussels of linguistic parity for the 24 official languages of the Union, in practice an insidious, technocratic tout-anglais is undermining democracy. We run over time and the Trivium staff invite the audience back to their stall to continue the debate over a glass of champagne. Despite the threat of English for European thought – which, at university level at least, does pose legitimate concerns – and the uncertain role of the internet in the future of periodicals, the French revue culture seems to be alive and well (almost to the bemusement of the association Ent’revues, organisers of the Salon and publisher of the meta-revue La Revue des revues, who offer a debate on the unexpected dynamism of the revue in today’s “wasteland”). Twenty-nine publications are participating for the first time and while some may only have a lifespan of three or four issues, La Revue des revues is celebrating Art presence’s twentieth year. Radio France has an “essai et revue du jour” segment every morning from Monday to Friday. For many, the revue is not simply a publication but extends into performances and debates in cafes and libraries throughout the year. The physical staging of the Salon – now in its twenty-third year – surely plays a role in the strength of the medium and the degree of solidarity between its diverse participants. The opportunities offered by membership of the online community notwithstanding, I can’t help feeling that despite the Salon’s relatively small scale, a similarly omnivorous event in Scotland or the UK could strengthen independent publishing here. By mid-afternoon, the hall is crammed, the intellectual types joined by those who have wandered in on their Saturday stroll through the old streets of Paris. At half-past seven, a ‘clown-poet’ sets up a makeshift stage at the front of the hall, with a washing-line of poems and various theatrical props. We are treated to the “lyrical, oneiric and fantastic universe” of T’es pas crevé si tu rêves (“you’re not done in if you’re still dreaming”). Air kisses float from cheek to cheek as collaborators and friends seek each other out in order to proceed to annual general meetings – official or not – over dinner. This year’s Salon is dedicated to Maurice Bénézet, author of the Roman des revues, a book of historical anecdotes and literary musings on the life of the revue. An extract adorns the Salon’s brochure: “Hommage dérive de homme comme le rêve dérive des revues… je crois“. It loses its poetry in translation, but never mind : “homage is derived from man [homme] like dream [rêve] is derived from revue… I think”.